A new team consisting of 15 students from 6 different states have kicked off their judging careers at Iowa State! 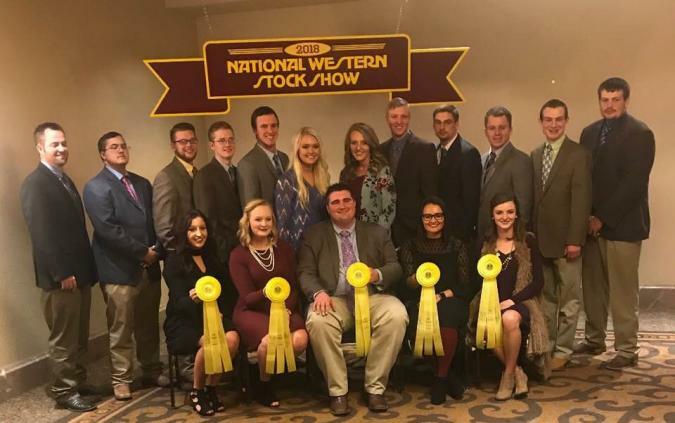 The spring judging season commenced with the Iowa State University Livestock Judging Team competing at the National Western Stock Show in Denver, CO. Iowa State University finished as the 3 rd overall team in swine judging, 5 th overall in beef judging, 5 th overall team in reasons and 5 th overall team. Individually, Macy Marek, from Riverside, IA finished 4 th high individual in swine and Lacey Knodle, from Fillmore, IL was 5 th high individual in beef. In the carload contest, Iowa State was paced by Evan Dietz, from Walcott, IA, who finished 7th overall in the contest. Iowa State finished 5 th overall in the carload competition. We are all proud to recognize Iowa State University as having finished in the top 5 in both contests with two completely separate teams. We wish the team the best of luck as they prepare to compete at the Sioux Empire Farm Show contest in Sioux Falls, SD on January 27 th. Pictured (Seated L-R): Lacey Knodle (Fillmore, IL), Skylynn Fleming (Paxton, IL), Jacob Hinshaw (Secor, IL), Mindy Cook (Camden, DE), Macy Marek (Riverside, IA). Pictured (Standing L-R): Dr. Chris Cassady (coach), Wyatt Orr (Mediapolis, IA), Reid Nichols (Atlantic, IA), Evan Dietz (Walcott, IA), Mason Edwards (Huxley, IA), Bailey Schneekloth (Jackson, MN), Rylee Derrer (Milan, IL), Mitchell Holcomb (Winterset, IA), Curtis Harsh (Radnor, OH), Casey Bradshaw (Twin Falls, ID), Colby Redifer (assistant coach), Tyler Triggs (Mount Ayr, IA). Iowa State Livestock Judging Team Wins Iowa Beef Expo Cattle Judging Contest!